It’s hard to deny that, in one way or another, virtually all business in the 21stcentury is global business. Almost every MBA program gives at least a nod to the international nature of supply chains, markets, and distribution these days. Even a small mom-and-pop manufacturer in the heartland can’t get away from the influences of global trade, and MBA programs have come to reflect that reality. But simply switching to an overseas supplier for a better price on materials and actually specializing in global business are two things that are worlds apart. The complexities of cross-border commerce, the influences of customs and culture on products and marketing, and understanding international currency and financing are all concepts worthy of deep and dedicated study for anybody who intends to lead a business with a global footprint. That’s the kind of education you get when you choose an MBA program with a concentration in global business. But because so many schools now offer an international business concentration, it can be tough picking the right one to fit you goals and your career path. Until now. With close ties to the business community, these specialty accreditors are far better at weighing the quality and relevance of business schools and specific MBA programs than you would be. They know exactly what skills American businesses are hungry for, and after decades of evaluating and offering feedback on business education programs, they know exactly what they are looking at when they review them. Accreditation is only the first filter. You can be sure that any program that has earned it meets all the basic qualifications necessary to offer a quality MBA, but there are thousands of schools that meet that requirement. To narrow down the choices, we went way further into the weeds. For starters, we took our own hard look at the core components of the program. Global business is still just business when you get down to it. Numbers are numbers everywhere in the world, so the principles of accounting don’t change. You need a solid command of the essentials of communication, of strategic planning, analysis, and decision-making no matter what language those functions are happening in. Speaking of language, we gave programs that encouraged learning a foreign language or with extra overseas immersion options high marks, too. The more exposure the school can offer to the realities of cross-cultural business operations, the better. We also looked for schools that offered at least some of their MBA courses online. Mobility and technology go hand-in-hand in today’s global business environment. You deserve to have some exposure to that, and to take advantage of the flexibility that comes with it, as part of your business education. And anyone who has taken courses online can tell you that the technology you interface with can make or break your experience as a student. Even the best campus-based programs can leave something to be desired in the online versions of their programs if they aren’t giving due attention to this important point. As experts of online education, we recognize this as a key element and gave a second look to any program that uses a well-established, user-friendly content delivery platform. Although businesses everywhere are affected by the nature of global commerce today, it’s the nature of the beast that universities closer to major centers of international trade are more likely to have more diverse student bodies, more internationally experienced faculty, and more multicultural curriculum features. So we looked hard at schools on the edges of the country, not strictly in physical terms, but in those regions that are more highly engaged in international trade: port cities, manufacturing hubs, capitols, headquarters of global business. In the same vein, we looked for schools that have overseas partner schools and regular relationships with multinational corporations. Those networks work to your benefit both as you study for your master’s degree and after you graduate. Connections are harder to forge overseas, and if you can get some baked in to your degree program, you’ll start out with a real career advantage. Finally, we looked for those programs that offered a little something extra in the international education experience. Does the school have a center for global studies on campus? Does it offer a dedicated certificate in global business? A dual degree program with a foreign university? Special projects or forums of interest to international business students? All these little unique factors and others went into the bucket and were given due consideration. And since you’ll have your own factors to consider, we took the time to list all of those special features out for each of these programs, together with entrance requirements, and the other practical data you need to know before applying. It’s all here for you—good luck! Ashford University’s MBA in Global Management features accelerated, six-week courses, taken one at a time, and a fully online course delivery for the best in convenient and accessibility for busy, working professionals like you. In addition to a comprehensive MBA core, you’ll specialize your graduate education in Global Management, which includes in-depth study in areas like global comparative management and global business strategy. You’ll also enjoy the best in online learning here through a virtual classroom, which allows you to communicate and collaborate with your peers…receive resources and feedback from your instructors…and take advantage of 24/7 classroom support and technical assistance. Ashford University is accredited by WASC Senior College and University Commission (WSCUC), 985 Atlantic Avenue, Suite 100, Alameda, CA 94501, 510.748.9001, www.wscuc.org. District of Columbia – Washington, D.C.
Student engagement is king at American University, even when it comes to online coursework. The school’s online programs prize interaction and the learning management systems support collaborative discussions, small group projects, in-person immersion, and live classes to help create that sense of participation. The principle continues with the school’s unique immersion courses. These three to four day experiences are held both in the U.S. and in overseas locations to bring students together and give them a kind of exposure that can’t be entirely replicated online. For students in the international business concentration, an experience in Madrid or Beijing could provide just the necessary bit of extra magic to help the curriculum hit home. Lynn University is where convenience in learning meets excellence in academia. 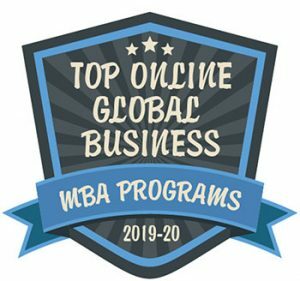 Lynn is home to the online MBA in International Business, which is ranked as one of the best online MBA programs in Florida by the South Florida Business Journal and U.S. News & World Report. This program offers a dedicated faculty with real-world experience…a collaborative learning environment of like-minded professionals…and a fully online course of delivery. Choose the MBA in International Business and you’ll be able to study wherever and whenever it’s most convenient for you. You’ll also dive deep into some of the most contemporary issues in worldwide trade and investments, such as international law, comparative economic systems, and compliance and ethics. In addition to receiving an iPad upon admission into the program, you’ll learn through the Canvas learning system, which features discussion forums, on-demand lectures, streaming videos, group collaboration software, and more. If you want to find a school that is absolutely serious about teaching global business in a real-world context, this is one way to do it: look for a school like Keiser that offers MBA courses in three different languages. You can’t fake an international focus when you have to ensure that you have multilingual professors to cover courses for students from overseas. When you are getting instruction in international trade and marketing management at Keiser, you are getting it from teachers who know what they are talking about first-hand instead of relating something they just picked out of a textbook. Global supply chain and human resource management classes give you the low-down on cross-cultural realities in international trade, while you will learn to integrate global financial markets and marketing considerations with the core MBA courses that build a solid base of skills that will let you hit the ground running at any company, whether local or multinational. UIC has a proven, research-based MBA program with plenty of opportunities for hands-on experience and great connections to the Chicago business community. That’s even better for the International Business option, since Chicago is headquarters for many multinational businesses such as Boeing, Archer Daniels Midland, and United Continental Holdings. You’ll also have the advantage of a distinctly multinational faculty, with business experience all over the world. Your courses in international finance, global innovation management, and international business operations will be taught by professors who have walked the walk at major corporations and spent years building their academic credentials along the way. With two strong, multi-week study abroad options, you’ll get the opportunity to walk that walk yourself as part of your experiential coursework, building a valuable multicultural portfolio that any major employer will find an asset. You probably wouldn’t peg a solid midwestern university like Anderson to have a top-flight MBA specialization in the field of international business, but the school just goes to show that you need to take a second look to find the hidden gem sometimes. The International Business Travel Seminar offers students the opportunity to not only study foreign cultures, but also to get a firsthand look at the inner workings of international organizations. That includes diplomatic as well as business organizations, a vital part of commerce that many global business programs overlook. The school also has one of the most flexible course portfolios, with online, residential, and hybrid class options all available to fit any student’s preferences and schedule. Put it all together with the practical, hands-on instruction offered in the business basics of finance, accounting, and operations, and you have a top-notch offering in global business MBAs that can stand up with the best of them. University consistently ranked among the most affordable Christian colleges in the U.S.
Campbellsville University, which has been consistently ranked among the most affordable Christian colleges in the U.S., offers adult learners like you an advanced course of study in global commerce and trade through their esteemed MBA in International Business program. This fully online, 36-credit program is led by faculty members with years of real-world business experience who cover innovative topics in international business like international marketing, managing global companies, and global policies and concepts. This program’s innovative curriculum will also provide you with ample opportunity to analyze some of the biggest players in international business, including the World Trade Organizations, the United Nations, and the World Bank. And, thanks to manageable and convenient eight-week courses, you can complete this fully online program in just two years. Boston is a global city, and the International Business Concentration in the Northeastern MBA program gives you a global perspective on business, supply chains, and markets that you won’t get anywhere else. With the Global Projects elective, you’ll participate in a functional consulting team, complete with international travel, to tackle a real-world problem for a multinational company in their global office. An International Field Study course offers an overseas classroom experience, immersing you in local culture and business practice for better understanding. And you can choose a Corporate Residency placement for a paid real-world internship position at a multinational company for further experiential learning opportunities. This MBA bursts at the seams with ways to give you exposure to international business practices. The MBA program at Eastern Michigan emphasizes communication, ethics, and analytical and critical thinking skills. All of those basics are important in any kind of business, but they are even more important in the global business environment. And what business isn’t global today? EMU understands how international business is woven through even the most mundane markets. Your specialization in international business will give you a boost in all sorts of industries, from automotive to retail to technology. Park is a small university with a big reach. The student body includes more than 260 international students from 60 different countries. That gives the MBA program a much more diverse and multicultural perspective than you might expect at a small Christian university in the heartland. That perspective helps inform several different global business specializations to the MBA, but our choice for the best option is the Global Executive MBA. The specialization focuses on projects designed to develop an ability to understand global business strategies and fast critical thinking on international aspects of business. Those include international economics, marketing, and global strategies. William Woods delivers an MBA program with rigorous coursework and a practical emphasis on building leaders who will succeed in the modern business world. Professional faculty with proven expertise in the corporate world teach analysis, financial competency, organizational theory, and decision-making skills in a curriculum that recognizes the challenges of operating in competitive global markets. Your capstone project will go up in front of an outside panel of business experts for evaluation, ensuring that no punches are pulled to help you become absolutely the best executive that you can be. Bellevue University’s MBA in International Management is where you’ll study what it takes to become a leader in the dynamic international business environment. Designed with insight from accomplished business leaders, the MBA in International Management features a faculty with real-world business and industry expertise, a curriculum that includes relevant simulations and case studies, and a small class of like-minded peers who learn from one another. Whether you’re a new or emerging business professional, this fully online program has everything you need to succeed in global business, including a focus on some of its most contemporary topics, such as international finance, international and global business, international consumer behavior, and regulation and ethics in international business. As an online student here, you’ll have access to the best in online learning resources, including mentorship and information from a career coach, academic advising from a student coach, and 24/7 tech support. An international business concentration should go way beyond just teaching you the nuts and bolts of global business—you should also come away with some experience and understanding of other cultures. With a student body that is around 50 percent Hispanic, you can get an immersion in other ways of looking at the world without ever leaving your class. Of course, you get all the nuts and bolts of international business, too, with courses in international marketing, HR, and global investment topics. Those are all layered on top of an already comprehensive set of core business courses that take you through advanced business statistics, policy and strategy, and social responsibility and business… vital components of the 21stcentury global business environment. Clarkson offers an international MBA that goes beyond just the usual two or three extra focus courses of a concentration. Instead, the whole MBA program revolves around training students to function at a high level in the global world of trade and economics. A term abroad at one of the partner schools will give you unprecedented depth in your studies. You’ll leave Clarkson equipped with the skills to navigate both cultural and geopolitical boundaries in the business world. SUNY – Empire State College’s MBA in Business Management with a concentration in International Business is a 36-credit, fully online program that’ll take your career to the next level. Designed for early- and mid-career professionals like you, this graduate degree features a solid MBA core that’ll strengthen your strategic thinking, problem-solving and ethical decision-making skills while allowing you to dive deep into international business concepts like global e-commerce, global leadership, international financial management, and global marketing strategies. Complete this program on a full-time basis and you’ll graduate in just 20 months. Slow down the pace and you’ll graduate in just 27 months as a part-time student. As an online student here, you’ll benefit from SUNY Empire State College’s dedicated staff, innovative online learning platform, and rigorous, relevant curriculum. Plus, you’ll have access to a host of online learning resources, including online tutoring, and guidance and support through the Writing and Math Centers Assistance. Cairn University’s MBA in International Entrepreneurship is where you’ll gain the skills necessary to become a leader in today’s global business environment. In addition to a fully online course of study, you’ll benefit from the program’s manageable and convenient, seven-week modules. Take just one course at a time and you’ll be able to complete this 42-credit program in just two years! Keeping in line with Cairn’s commitment to Christian values, the MBA in International Entrepreneurship focuses on the integration of biblical ethics and wisdom within the framework of business. You’ll benefit from the best in distance learning here, including the eLearning online learning platform, which features video instruction and interactive learning activities. And as a student of this program, you’ll also have the unique opportunity to complete a week-long residency in Madrid! Your education at IUP starts with learning that there is a town in Pennsylvania named Indiana. It’s only the first step in expanding your horizons much further than you ever imagined they could go as an MBA student focused on international business. IUP goes out of its way to attract international students, which means you’ll be rubbing shoulders with smart, experienced people from other countries and other cultures… the kind of preparation for international business that can’t come out of a book. That also gives you a network that can be invaluable when it’s time to find positions after graduation. Dual degree option with La Rochelle University in France as the ultimate international business credential. When you come across an international MBA program from a school that has a dual-degree partnership offering with an overseas university, you know you’ve found a place that takes international business studies seriously. Pitt State is one of those places. A partnership with La Rochelle University means that you are working with students and instructors who routinely experience business in a global context, and can offer you the most current version of trends and techniques that are shaping business around the world today. Your career, expanded, is at the heart of Point Park University’s MBA in International Business. In addition to gaining a deep understanding of advanced business concepts like ethics and business law, the MBA in International Business will help you take your skills to an international level, allowing you to thrive in the global marketplace. Thanks to this program’s hands-on projects that include both individual and group assignments, as well as opportunities to network with global company leaders in Pittsburgh, you’ll be able to easily transition learning from the classroom to the real world. Just a few of the topics you’ll explore in this program include cultures of international business, international economics, and international finance. This 36-credit program is taught by Point Park’s internationally practiced, full-time faculty, so you’ll feel confident knowing you’re receiving the most relevant, contemporary course of education in international business concepts. Abilene Christian University has a strong reputation as one of the leading private Christian universities in the western United States. That’s exactly what you’ll find in the international business track of their online MBA program—a professionally taught program that combines courses in leadership, organizational innovation, and faith and ethics to combine all the qualities that modern multinational business management demands. In classes that were designed to cater specifically to working professionals, you will join a dynamic online learning community that will hand you effective tools to improve your business skills directly from day one. The Texas A&M MBA program uses student-focused learning techniques that will present you with opportunities to make decision based on critical evaluations of real-life situations. This case-based education is a terrific approach for developing your international business acumen. The One Planet Leadership training is also a big plus for a future in global business. Focused on sustainability and the social, ethical, and environmental aspects of business leadership, this approach sets up future executives in international business for successful participation in a global business environment that is increasingly aware of its own role in social and environmental justice. A rigorous approach to critical thinking and problem solving skills training gives you the toolset to navigate this narrow path that combines profitability with responsibility… a combination sure to be in big demand among multinational corporations for decades to come. There is no better place to study for an MBA in global business topics than a major international city. Seattle’s University of Washington has got you covered on that and more: a diverse, exciting, cutting edge port city on the trade-heavy Pacific Rim, swarming with global businesses like Microsoft, Amazon, and Google, UW is a destination for future executive candidates from the United States, Japan, China, and more. The core MBA curriculum naturally has plenty of international focus all by itself, with experiential learning opportunities that naturally fit into the city’s dynamic place in global trade. But the Global Business Certificate option, offered by the Global Business Center, takes it up a notch with the addition of a foreign exchange option, language learning, a global business study tour, and a global-focused practicum that ensures you get your hands dirty in international business before you ever get them on that hallowed MBA.